2011 - Just updated w/current availability. Be sure not to miss our sale page for great deals on Edna's world renowned work. 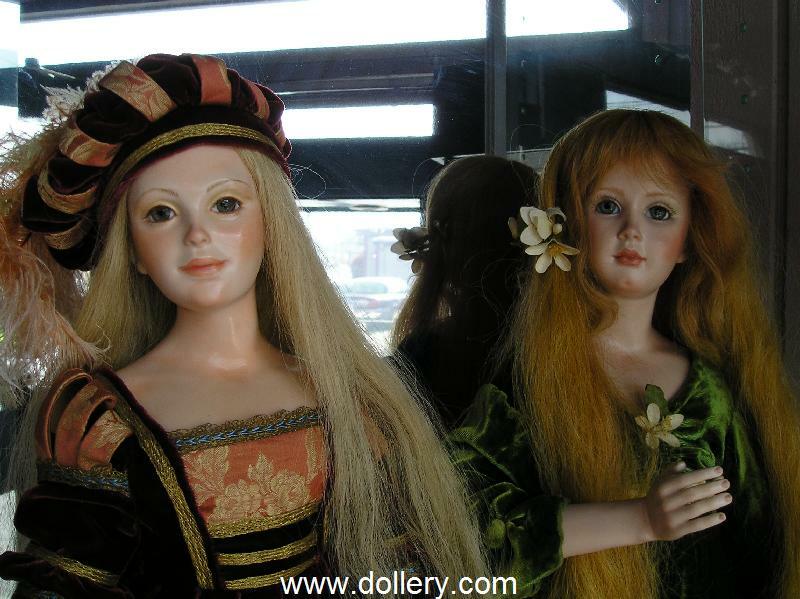 These beautiful wax over porcelain dolls were created especially for our shop. Edna Dali from Israel attended one of our earliest doll shows way back in the early eighties. She came to our show for the first ten years and every year she sold out of her fimo full body sculpts! Later she focused on wax over porcelain dolls which are equally magnificent. Edna joined us for our 16th & 17th Doll shows in 1998 and 1999 in addition to over 10 years of shows in the eighties. She has created some really special one of a kinds below just for the dollery. Enjoy and feel free to email kmalone@dollery.com with any questions you may have. Edna is featured here to the left at our doll show. Wax over porcelain, One of a kind outfit. Gorgeous human hair wig, removable fabric wings. Other one-of-a-kinds with this face may be special ordered. E-mail for details.